Everything is more fun on a stick, right? It takes hardly any time at all to put these together, and they are good enough for company! 1. Preheat the oven broiler on high. 2. Soak skewers in water if you don’t want them to cook/burn in the oven. 3. Cut the chicken breasts into strips and thread them onto about a dozen skewers. Place the prepared skewers on a parchment paper or foil-lined baking sheet and set aside (you can stick them in the fridge if you’d like). 4. In a food processor or blender puree the peanut butter, coconut milk, lime juice, vinegar, honey, garlic, jalapeno, and chili powder together. 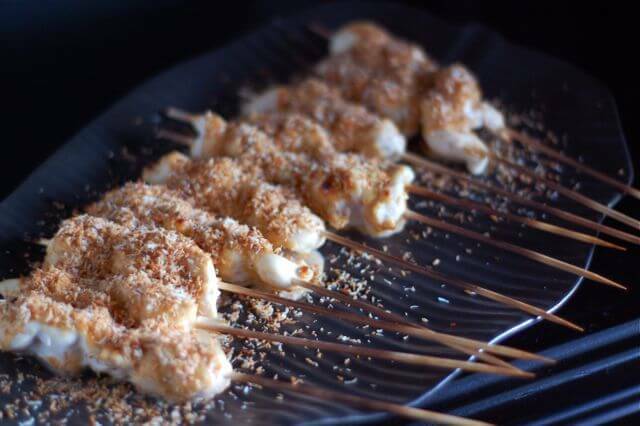 Remove ¼ cup of the peanut mixture and drizzle/brush it over the raw chicken skewers. 5. Place chicken under the broiler to cook. After 4 – 5 minutes take the baking sheet out, turn the skewers over, drizzle another ¼ cup peanut sauce on top, and cook for 4 or 5 more minutes or until cooked all the way through. 6. Once the chicken is done take it out, drizzle on the remaining peanut sauce (or serve it as extra dipping sauce on the side), and sprinkle the toasted coconut on top.